The final of the JMS Veterans Shield was held at Finch Hill on Thursday 17 August. The two teams involved were Marown and Nobles, both playing off their home handicap of +20, which made it a straight match-up with the handicaps not influencing the results. The weather stayed fair and there were a good number of spectators present hoping to see some exciting play and in this they were not disappointed.. The first three games off saw a clear win for Nobles, courtesy of Sylvia Kennaugh, which was almost balanced by a good win by Philippa Taylor for Marown. The third game had been a real battle with Viv Cook coming through 21-19 against Shirley Whelan, giving Nobles a lead of just six points at the half-way mark. The second set of three games were all close, but went the way of Nobles, although the Marown ladies fought well with two 18’s and a 16, giving them the titl , and the trophy, 135-118. The presentation was made by Janet Shilling, who sponsors the event. She thanked Finch Hill for the use of their facilities and Pat Robertson for the scones! She also praised the standard of play, with some great ends and spectacular bowling. Winning captain, Josie Harding, said that she hadn’t expected to win but everyone had enjoyed the experience and they were determined to retain the title next year. Castletown A consolidate their League lead. Thursday 10th August saw the League Leaders Castletown A travel to Nobles Park to play the Nobles B Team in a match that went as the formbook would suggest with the Castletown men taking a 6-2 win with only Tony Birch and Lawrence Doogan achieving the magic 21 for the Nobles side. Back at Castletown the ‘Towns’ B Team was having a battle for the win with Nobles A and it was the Douglas based side who took a 5-3 victory. Peel Sunset A pulled no punches in their match with Ballaugh A taking an 8-0 victory in the West of the Island while the Peel Sunset B Team lost 6-2 to Ballaugh B.
Douglas A had a solid match at the ‘Villa’ to beat North Ramsey A 5-3 whilst the Douglas B Team lost 6-2 to North Ramsey B at the Mooragh Park with Alan Robertson and Paddy Kinsella being the two winners for Douglas B.
Onchan A played the Onchan B Team and came this also went to form with Onchan A winning 6-2 while in the ‘deep South’ Port St Mary B beat South Ramsey 6-2. So as we came to Tuesday 15th August the question was whether a strong Marown Team could halt Castletown A’s run of victories and their were some very close games in this match but Castletown A ran out 6-2 winners with Steve Bridson and Ian Kissack being the only winners for Marown. Castletown B travelled to Finch Hill and came back with a 5-3 win and a little further up the road at Nobles Park the Nobles A side beat Port St Mary B 7-1 with Peter Collins being the only winner for the Southerners. Ballaugh A hosted Douglas A and despite the Douglas side being short two regular ‘first teamers’ they managed a 5-3 win while back at the Villa Ballaugh B reversed that result by taking a 5-3 victory over Douglas B. In the ‘battles of the Parks’ North Ramsey A beat Onchan B 7-1 at the Mooragh Park while in Onchan Park it was Onchan A who beat North Ramsey B 6-2. Port Erin beat Peel Sunset C 6-2 with Bert Quayle and Clyde Quine winning for the Westerners and just around the corner at Port St Mary the Port St Mary A Team beat Nobles B 7-1 with Brian Atherton winning for Nobles B. South Ramsey put up a strong performance against Peel Sunset A but eventually went down 5-3 . So after Game 34 we now have Castletown A consolidating their lead on 58 points with Port St Mary A second on 52 points closely followed Peel Sunset A and Onchan A who are both on 51 points. Bradford is the Mannin form at the Mannin Hotel Douglas Town Cup. Saturday the 19th August saw the Mannin Hotel sponsored Douglas Town Cup Event being staged by Douglas Bowling Club at the Villa Marina. With both Ladies and Men’s events being held side by side on the ‘Villa’ Bowling Green there a great day of bowls with the events starting at 10-30am and finishing around about 5pm. The men’s event started with some great early games being played in the blustery but dry conditions with just the very occasional short light rain shower not really being enough to dampen anyone’s spirits. As we got to the semi-final stage we saw two interesting matches with the first being between South Ramsey Club mates Dave ‘Dido’ Kelly and Glynn Hargraves with Glynn eventually running out as the 21-18 winner. In the other semi final we saw ‘dark horse’ Edward Carlyle who had already despatched John Kennish and Neil Withers up against an on form David Bradford. It was not to be Edward’s day however as David was to strong and took a 21-14 win which put him into the Final against Glynn Hargraves. There was some good bowling in the Final but it was David Bradford who took the Trophy with another strong performance winning 21-16. In the Ladies Event there was once again some great bowling and the first semi final was between Paula Garrett who had beaten good opposition in Alison Keggin and Fiona Kennish en route and Helen Martin who had beaten Lisa Boland and Janet Monk to get through. Paula seemed to handle the blustery conditions better but both ladies played really well with Paula running out the 21-14 winner and earning a place in the Final. The second semi final saw a tough battle between Lyn Bolton and Margie Tasker and after some great bowling Lyn just made it past the post with a 21-20 win. So with the Final being between good friends Paula Garrett and Lyn Bolton we were looking forward to some good bowling and that is what we got. 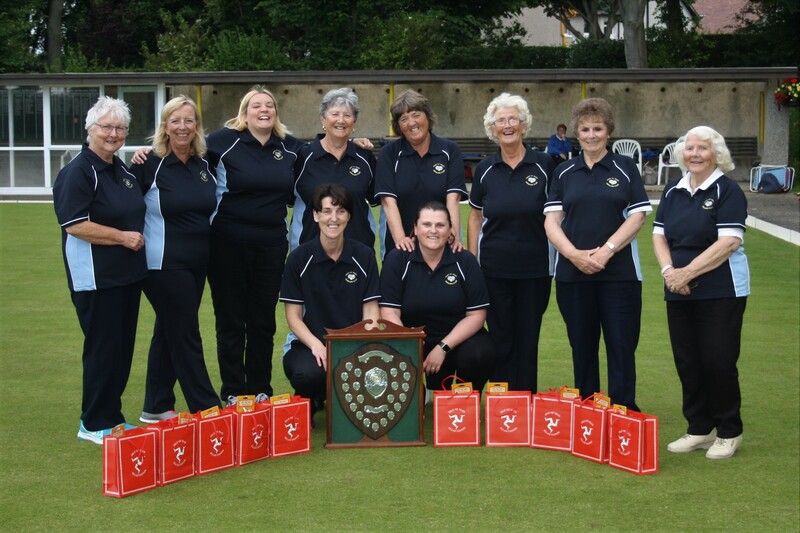 Lyn looked at one stage as if she was building up a significant lead over Paula but the Douglas Bowling Club player held her concentration and came back to take the Trophy with a 21-17 victory. So after a great days bowls the two Mannin Hotel Douglas Town Cup winners were David Bradford and Paula Garrett. In their ‘Winner’s speeches’ both competitors thanked Mr Keith Lord and the Mannin Hotel for sponsoring the event and thanked all those who helped on the day. 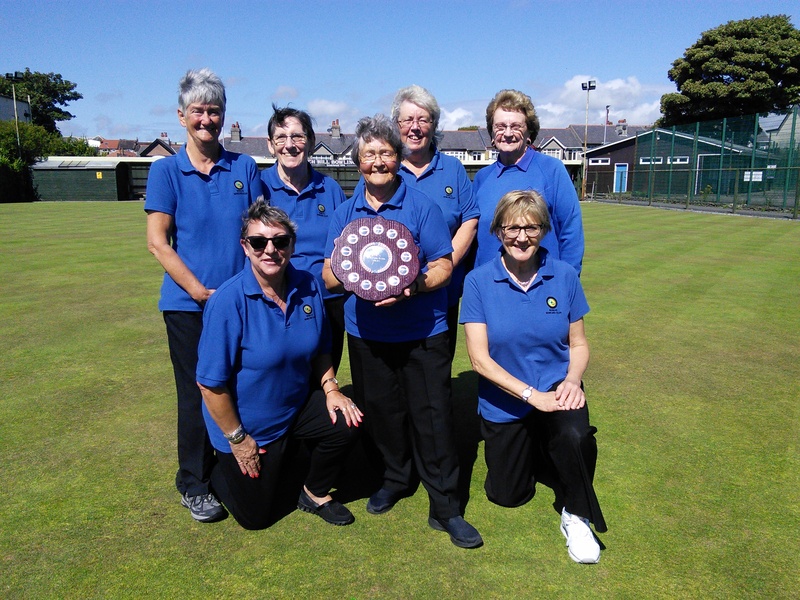 Port St Mary finished the season in a blaze of glory when they recorded a maximum at Onchan, with seven of their nine wins being to single figures, in the C Tarleton Hodgson sponsored league on Friday 18 August. Only two of the home players put up any resistance with Jo Smith and Sue Gawne both reaching 17 against Katy Williams and Val Macfarlane respectively. Last week South Ramsey leap-frogged over Castletown for second place, and with both teams reaching the same score, 165, they remain in that order. South Ramsey travelled to Ballaugh who had two winners in Barbara Graham, to single figures, and Christine Macdonald, while Port Erin also had two winners against Castletown. Lynda Cadamy, to single figures, and Jean Thackrah won their games while Jackie Elliott almost added a third losing out 20-21 to Kath Kinley. Nobles had a 6-3 win against Peel Sunset, with two wins to single figres, the three winners for Peel being Mary Moffatt, Joyce kelly and Sarah Quirk. It was a low scoring affair at Douglas with six of the games, two to Douglas and four to Mooragh Park, being won to single figures. In contrast Rebekah Kelly and Aalish Howarth went all the way with the Mooragh player coming through 21-20.The closest match of the night was at Purt le Moirrey, where the home side won 5-4 on games, with one of their games and two of Marown’s ending 21-20. For the home side Roma Ware pipped Rosie Winckle while Elaine Dewhirst and Lil Smith came through against Linda Dawson and Brenda Hawkard by that score. Congratulations go once again to Port St Mary for retaining the title and also to Ann Maddrell for winning the merit, just overtaking Mary Moffatt on points against. The final match in the Trend sponsored ladies’ over 60’s league was played on Tuesday 15 August. The positions at the top of the table had been already decided, with once again Port St Mary A taking the title followed by Peel Sunset in second place. The westerner’s final surge, when they dropped a total of four points in four games, was too little too late but did keep the difference between the two teams down to 47 points. Our congratulations go to Val Macfarlane, Port St Mary A, for winning the Merit, and commiserations to Mary Moffatt, who, as in the night league, was level on points scored but lost out on points against. The Dorothy Piearce Memorial Pairs were held at Grange Park , Warrington on Saturday 12 August, where the Isle of Man was represented by Philippa Taylor and Joyce Ogden, who put up a very creditable performance. In the first round they faced the formidable Mid-Cheshire pairing of Jackie Ollier and Jean Starkey and made their way through to the last 16, winning 21-14. 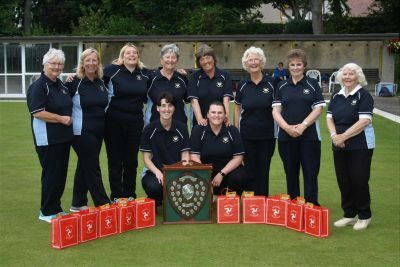 This matched them up with the reigning champions from Merseyside, Lynsey Gorman, who is well known on the island as one of our regular Bowls Festival participants, and her partner Anita Richardson. After a hard fought battle, Lynsey and Anita triumphed 21-16 and then progressed to the final where they retained the title. Last week saw two fixtures played for teams in division one of the Ellan Vannin Fuels sponsored league, in game twenty Marown A had a comfortable 8-2 home win over Douglas A, but they weren’t afforded a comfortable passage when they made a trip to the Sunset City on Wednesday evening, they were pushed all the way by Peel A, Marown A took the victory by the two aggregate points, credit must be given to Peel’s Dougie Allan who stepped up to first team duty and defeated John Gelling 21-14. In game twenty Onchan A had a solid 8-2 home win over Castletown A and repeated the score line on their visit to Ballaugh A in the second fixture, Port St Mary A made the short trip to Port Erin A but didn’t have it all their own way winning 6-4, 139-124 on aggregate. South Ramsey B hosted Peel A in game twenty and although Peel had six winners to the two of the home side the aggregate was tied an 144. Douglas B played a home fixture with North Ramsey A in another closely fought affair, North Ramsey had five winners but lost the aggregate by a single point. On Friday night South Ramsey A and B met and the 9-1 win was probably what would have been predicted, on the same evening North Ramsey A made up for their disappointment earlier in the week with a 7-3 win over Castletown A.
Marown B would have been pleased with picking up eight points in their away fixture against Port St Mary C , but Onchan B suffered a 7-3 away loss to Nobles B and now trail Marown B by seven points at the top of the table. Port St Mary B had a storming 10-0 win over Douglas C with an aggregate margin of ninety two points. Peel B hosted Finch Hill A and were beaten 6-4, disappointing for Peel B but Finch Hill A are picking up good points as I have mentioned in previous reports. With Peel C sitting out this week’s fixture it was a chance for Marown c to close the gap and they did their cause no harm by picking up seven points away at Ballaugh B, Finch Hill B versus Ballaugh C was the closest fought league fixture of the week four winners a piece and the aggregate tied on 134. A team representing the Isle of Man travelled to Winnington Park, near Northwich in Cheshire, to play in the Mavis Dearden Supplementary County Championship on Sunday 20 August. The competition consiste of eight teams made up from the the second and third placed teams in the four sections of the county championship. A withdrawal of one of those teams led to an invitation for the Isle of Man to participate. The eight teams were split into two groups, each group being played as a round-robin. The Isle of Man was in a group containing the holders, Burton and District, the 2013 winners North Lancashire and Fylde, and Warwick and Worcester. The green they played on was small and rectangular and it took some players a while to get used to it. In their first game, against holders Burton and District, the team had three winners, Chris Price, Debbie Leece and Jayne Kneen, but despite creditable performances from the other five lost out 136-161 on points. The second game, against Warwick and Worcester, was drawn on games, the four winners for the island being Mary Moffatt, Lynda Cadamy, Jayne Kneen and Joyce Kelly, but won on points 151-140. The game against North Lancs. And Fylde was also drawn on games, but unfortunately the English side had the advantage on points 149-146. The four Manx winners were Heike Perry, Lynda Cadamy, Debbie Leece and Jayne Kneen. Burton and District 461; Warwick and Worcester 448; IOM 433; North Lancs and Fylde 421. The island girls proved that they are a force to be reckoned with, and all put up some very strong performances. Port St Mary Ladies have won the league for a seventh time and the last four consecutive years. They complete the double having beaten Nobles in the final of the Jean Kelly Memorial Knockout competition earlier in the season. Ann Maddrell has won the Ladies Merit on points against following her 21-1 victory in the final match of the season. Mary Moffatt who was leading the ladies merit going into the final match won 21-18 but Ann’s larger victory means she takes the merit.